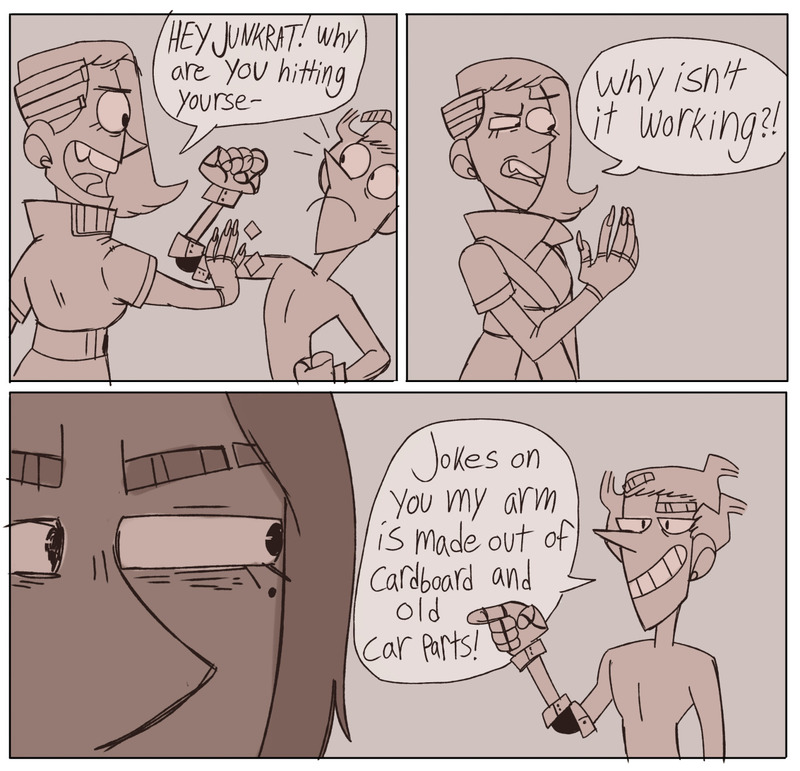 Manly Guys Doing Manly Things » I hope this can cheer up my Junkrat friend. I hope this can cheer up my Junkrat friend. Man it’s been a tough week to get work done. Nah, she just hacked his tire. Junkrat’s probably quite tired of that, thus he’d consider Sombra a talentless hack. But he’s on quite a roll! Hahaha. Junkrat would just start dancing around for the hell of it while everyone is hacked. I don’t know how you do such a good job of keeping all of the overwatch characters both funny and in character. Well, they all have pretty clear and archetypal personalities to begin with, so that probably helps. In my noggin junkrat is dancing to a irish gig. The technicalities of it are more complicated to explain as I’m sure someone will step in to Well Actually us all about later, but colloquially, “Not digital”. Like a cassette or VHS tape would be an analog format. A lot of art folk I know use it to refer to art that was drawn on paper VS on a computer, because most of the ways people refer to digital art normally makes it sound like the computer is doing all the work. There’s more detail but that’s pretty much it. Digital and analog are mostly colloquial concepts out in the world. As you look deeper it only starts to blur. Really simple actually: Non-numeric. An analog device isn’t read, it’s measured. Like looking at your watch’s hour and minute hands to see the time. An analog camera exposes chemical film to varying amounts of light. Even an analog calculator(slide rule) doesn’t *interpret* the values you put into it – all you’re doing is sliding two ruler scales past each other, for you to eyeball the closest result. In all these processes, the machine doesn’t care about the value’s meaning. There’s no counting or computation, and nothing to fool except physical processes and the user themselves. Hence, “too analog to hack”. The core of analog vs digital is based on the idea that digital things have *discreet* values, and analog things have *continuous* values. If you think of a simple computer, it can count integers easily (1, 2, 3, etc) but it can’t do fractions. Modern computers can approximate fractions, but they have a limit to their precision. Real-world analog values are, by contrast, infinitely precise. The universe doesn’t have round-off error (at least under normal non-quantum environments; it’s important to ignore quantum physics at all times). 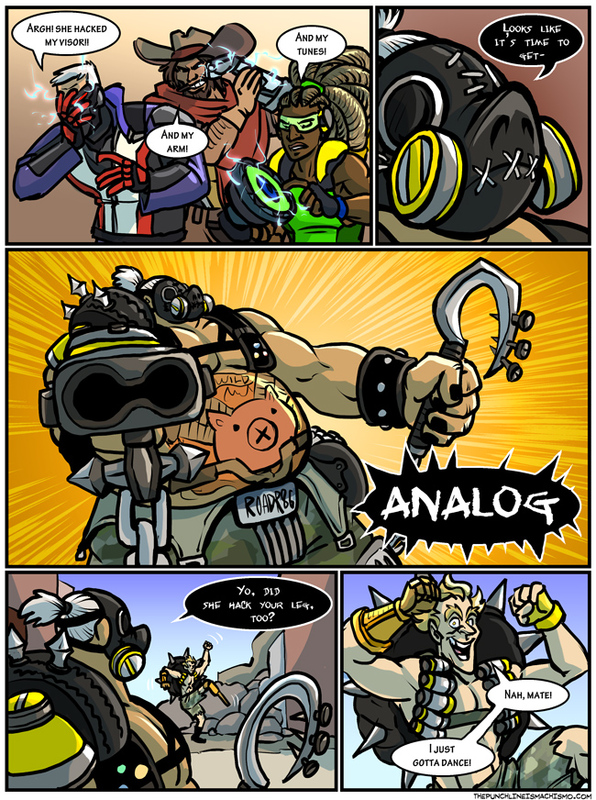 In this context, Roadhog is using the colloquial secondary meaning of analog vs digital to refer to non-computing physical hardware (analog), as opposed to a computer-driven hardware with some sort of microchip control or full-computer control (digital). In other words, he’s got a gun that works with gears and springs and stuff instead of having a computer, and you (usually) can’t use software to hack things that don’t have computers. …now you’ve made me very curious about when you possibly *could* use software to hack things that don’t have computers. Perhaps messing with old-fashioned telephone systems. Junkrat already does a version of the famous “Hello my baby, hello my honey” Ragtime dance scene known as the ‘Michigan J. Frog dance’ from Looney Tunes in his dancing emote. I once had an NP hacker try to throw off the ninja-adept by screwing with his rifle sight and popping the magazine. In a bit of random luck, he had the exact powers which allowed him to catch the dropping mag, and throw it back in. Then started firing analog. But who is Boromir in this situation? Which character won’t stop dying? That’s…kinda all of them? I mean, they all die a lot. How does one hack what is literally a chain and hook, anyway? If you watch Sombra’s character video she seems to project a physical circuit matrix over the surface of things she hacks. If you want to be mildly ridiculous, this suggests some sort of amorphous material or nanomachines that she can physically project onto ordinarily inert hardware and interfere with it. If you prefer a more reasonable interpretation, that hacker circuit goo she sticks on things can’t hack the chainhook at all, but it *can* hack Roadhog’s nervous system, and just paralyzes his arm. The Overwatch World has “hard-light” technology/magic. Symmetra’s job and lore are based around building cities out of it. Sombra can could easily be making electrical circuits out of Light where no circuitry exists. Nanites! …or we can go with the Simpsons Y2K joke that everything has a microchip in it and have Roadhog get attacked by a carton of milk next. Sombra’s in-universe canon abilities as seen in her Origins trailer and the Infiltration and in her ARG (Alternate Reality Game) are Hollywood hacking, but at least they’re clearly limited to electronics like computers, robots, Omnics and so on. Nowhere is there any indication that she can remotely hack cyberlimbs like McCree’s arm, let alone the brains and nervous systems of unaugmented living people. But Sombra’s gameplay abilities are almost the exact opposite. Her hacking and EMP blast can remotely shut down other player characters’ LShift, E and Q abilities (except those that are already placed on the map, like Junkrat’s steeltrap) and right-click abilities that aren’t shooting, but not people’s weapons or standard movement, including passive abilities like Genji’s wallclimb and doublejump and Lucio’s wallriding. Her powers affect map features like healthpacks that only exist in-game and have no existance in-universe. She can magically stop Roadhog from throwing his hook or McCree from doing a tumble and even “delete” blue shield bars from Zarya’s and Zenyatta’s health bar (with her EMP), but she can’t shut down Symmetra’s teleporter or Torbjörn’s turret or control Bastion’s electronic brain by hacking. Logic not applicable. Michael Chu, the Senior Game Designer on Overwatch, openly stated in an interview with Rock, Paper, Shotgun gaming magazine on 23 May 2016 ( https://www.rockpapershotgun.com/2016/05/23/overwatch-michael-chu-interview/ ), that in-game things like gameplay, team composition and map objectives, are disconnected from the story canon of the Overwatch universe. The maps contain hints of canon lore, but his reply to the question “Why do characters who are allies in the Lore fight on different teams in the game, while enemies like Tracer and Widowmaker can be played on the same team?” was that their design concept was “gameplay comes first”. Overwatch is a 6v6 first person team shooter first and a story project second, thus gameplay trumps narrative logic. Same with fall damage, it does not exist in-game, yet no-one would question that it exists in-universe. That is why I personally would have prefered Sombra as an NPC enemy for a brawl similar to Junkenstein’s Revenge, where she could have sent mobs of controlled Omnics at the players. Gameplay abilities =/= Canon Lore. As Coelasquid said, Roadhog should be too low-tech to be “hacked”. If Blizzard ever has a brainfart and shows Sombra “hacking human brains through empty air” in canon material such as movies and comics, I’m going to scream. Roadhog just pretends to be hacked so he can be one of the cool kids. He just doesn’t want his team to feel bad about getting hacked. They already live with the terrible burden of not being one man apocalypses, he ain’t gunna rub it in. Considering how much dirty fanart of him i find, you’re excused. Roadhog and Junkrat have painted nails in the game. I hope so too. That sounds really adorably silly. On a sidenote, I actually had to double-check, and Coela’s right. I just never noticed… And now I’ll never stop staring and wondering when they found the time. I actually thought it was from the dirt and soot getting beneath the nails since just working with charcoal makes my nails black. But I do love the thought of them painting each other’s nails. I had not noticed this. That’s delightful. Irish jig? Oh no, Junkrat is a morris dancer, of the Pratchet school. I was just filling in music automatically, and somehow* jumped from Lindsey Stirling and Blackmore’s Night to Wardruna. Somehow Junkrat prancing around to Fehu is hilariously appropriate. Your Junkrat friend should be happy, Junkrat is pretty much a hard counter to Sombra. AoE damage to kill her cloak, doesn’t need his abilities to win 1v1, and can drop a steel trap on her Teleporter pad if he finds it to guarantee a no-effort kill. I’m also waiting for the inevitable Youtube compilations of Roadhog hooks grabbing Sombra completely on accident and then one-shotting her. Because those are going to be hilarious. I only JUST got OW. Loving Zarya oh so much, especially her Cybergoth look. That lady is a BEAST and doesn’t get enough love. I feel this gives the best reason why it wouldn’t be affected. Having never actually played the game, most-everything I know about Overwatch I learned from MGDMT. As such, Junkrat is my favorite character.